Amera Plastic Mouldings is now making a diorama base piece for the Airfix Dambuster diorama. Amera are pleased to announce that we are now producing the vac formed Dambusters diorama originally included in the Airfix Dambusters gift set. The model is not to scale but the design is based on the Mohne dam. The diorama will compliment the Lancaster bombers currently available from Airfix to produce a great display. The Dambusters diorama is supplied in white polystyrene in 3 parts, the dam and lake, and 2 tower roof mouldings. 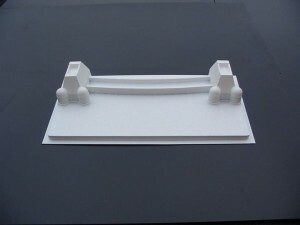 The dam moulding is produced with a wide flange around the base to provide added strength and rigidity. Price £13.99 Available in the next 2 weeks.